learn from the past. adjust for the future. How did my project measure up against my industry peer group? 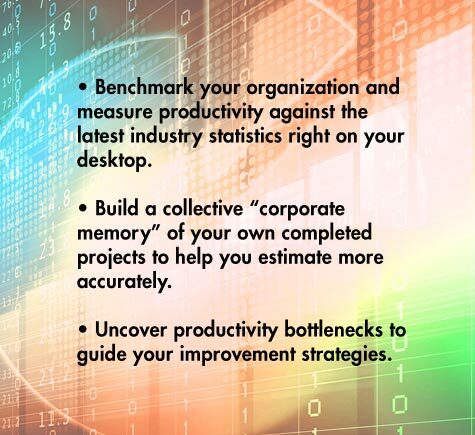 Have our investments in process improvement boosted productivity? How is the quality of our delivered software changing over time? What impact are requirements churn and staff turnover having on productivity? What kind of cost and schedule performance can we expect from different divisions? SLIM-Metrics measures the results and performance of your completed projects against industry data from more than 12,000 releases – projects developed with both traditional and Agile methods. The tool pin-points areas where your work was on target and areas of error or inefficiency. Combine SLIM-Metrics + SLIM-DataManager® for deeper analysis and benchmarking. This powerful combination of tools provides creates custom trendlines, queries and analytical views, and ROI insight. See which of your projects are leading the pack and which need improvement. Capture history and create custom metrics for your organization. SLIM-Metrics and SLIM-DataManager, included with the SLIM-Estimate tool, answer your questions with an easy-to-use, customizable query-builder. There’s no need to master complicated SQL statements, and our flexible analysis views allow you to easily modify the chart/report outline or swap graphics. Some organizations are just getting started with measurement programs. Others have data, but no easy way to organize and analyze it. SLIM-Metrics and SLIM-DataManager work together to support both types of organizations. SLIM-DataManager helps you create a corporate database, then teams up with SLIM-Metrics to analyze your data and uncover key relationships and trends. ……………….. Features & Benefits ……………….. Powerful Query Capability: Create specific subsets of your data and compare them to one another. Example: What is the average productivity for Client Server, C++ projects using 5-to-10 person teams, compared to Web-based, Java applications? Supports Multiple Views : Analyze any measure or metric against any other(s). SLIM-Metrics lets you create unlimited of charting/report views within a single workbook. The graph and report functions are highly customizable. Industry Benchmarks: SLIM-Metrics includes recent industry trend lines for each of the standard measures and metrics. Benchmark yourself against QSM’s database of over 12,000 completed projects, or create your own trend lines from your own completed project data. Statistical Analysis Tools: Uncover relationships hidden in your data. SLIM-Metrics contains a host of statistical and regression analysis features, including four different curve-fitting algorithms. Compare Up to 5 Data Sets Per Chart: Compare and contrast data from up to five different data sets on a single chart. This is especially useful for internal benchmarking and competitive positioning. Special Project Identification: Track a single project through multiple graphs. This is useful for visualizing trade-offs and cause/effect relationships. Point & Click Project Details: Identify or view details for any data point on a graph with a single mouse click. Time-saving Features: Add custom notes, zoom a graph, read x-y coordinates, and configure charts/reports with just a few mouse clicks. Presentation-Quality Outputs: SLIM-Metrics produces superb graphical outputs. You can easily print a set of graphs and tables that clearly make your point. Windows/MS Office Integration: Export features allow you to easily move your data, graphs, and tables into and out of other Windows or MS Office products. SLIM-DataManager: The flexible SLIM-DataManager builds on a set of essential core metrics that are most meaningful to your organization. A larger set of predefined and user-defined metrics helps you achieve increasing levels of process maturity. Historical Data Capture: Store all of your organization’s historical data (core metrics, plus custom measures that you define) in a single, open, relational database. Customizable Database: Quickly extend your basic data to include any measures you choose, then use powerful graphing and statistical tools to analyze your data. Fast, Efficient Data Entry: SLIM-DataManager lets you set up default values to describe your environment. The tabbed dialogue interface makes data entry fast and consistent and reduces time spent on error-checking. ODBC Compliant File Format: The SLIM-DataManager database is OPEN. You can create seamless interfaces to other ODBC-compliant tools. QSMA consultants are recognized experts in the field of software development planning and control. All licenses for the SLIM Tool Suite include documentation, responsive phone consultation, and technical support. Contact QSMA for more information on SLIM-Tools and for a free demonstration CD, or call 413.499.0988 to speak with a QSMA representative.